I can hardly wait. Easter is such a joyous occasion. And what an exciting line-up of events is on tap to celebrate the holiday. Do you want to see a Sky Diving Easter Bunny? “Join us for the annual Eggstravaganza hosted by ——– Church….. We will have a Sky Diving Easter bunny that will land in ——- Stadium and take pictures with guests. There will also be games, music, inflatables, free food, and a big easter egg hunt with over 15,000 eggs! Also, there will be a helicopter involved. You don’t want to miss it! How can you do better than that? A sky-diving Easter bunny, games, inflatables and over 15,000 eggs. Memories that will last….well…at least a day or two—to say nothing of what all that sugar will do to your health. Yes Sir, that’s what Easter is all about! Oh, yes, by the way, if you ask, they’ll have a worship service or two on Sunday. No eggs, no inflatables, no games—just entertainment with good music and smoke to set the atmosphere. One would wish that we would put as much effort into inviting people to come to Christ and talking about His resurrection and our salvation through Him. Yes, if we Christians do what we are supposed to do and put as much money and energy into letting God be known and if we encouraged and welcomed people to Easter Sunday services, people would leave much, much more fulfilled and satisfied than they will after attending a bunny bash. On Easter Sunday, of all Sundays in the year, we have something to share with people that is not only life-changing but eternity-changing. A gift that will affect and change more people than many millions of jelly beans will ever be able to do. People may not realize it, but many are looking for much, much more than decorated eggs. They are seeking “the way, the truth and the life”—the eternal way, truth and life that only God can give them through Jesus Christ. There’s another statement from media experts that serves as a warning to those of us who deviate from the evangelistic task we have. It says, “What you win them with is what you win them to.” In other words, if we get people to come out for sky-diving bunnies and jelly beans, that’s what they will receive, what they will go away with and nothing more. If, on the other hand, we attract them with the message of forgiveness and salvation, meaning and purpose through Jesus Christ, then that’s what they will come seeking and carry away with them. Some will argue that the real reason for the sky-diving Easter bunny event is to expose the church to those who come for the fun and encourage them to attend the services of the sponsoring congregation. All well and good, but isn’t it just a little bit, or a maybe a large bit, deceptive and, if you are honest, unethical? To manipulate people to go to church by offering them jelly beans and a parachuting bunny? How will they trust the message they hear if there was a form of deception in attracting them there? Millions are seeking meaning and truth and peace and hope and eternal assurance. Perhaps our resources and efforts should be put into offering those things, honestly and openly. Please feel free to leave comments on this site. Those comments posted through the button on this page will be posted if appropriate. Comments sent directly to me are welcome and I will respond, but they will not be posted. Also please forward this link to others who might be interested in this blog. To receive notification of future posts, please click on the “follow” button along the side of this page or write to missionaryjournalist (at) gmail (dot) com. If you no longer wish to receive these articles, please let me know at that same email address. This is the second of two blog postings taken from a presentation at the Honduran Missionary Conference a few years ago. If you are a missionary, I hope you will take this to heart. If not, perhaps you know a missionary or your church supports one and you could pass this on. When I presented this at the conference, about half-way through, I heard people laughing. Personally, I didn’t think it was at all funny. Then, I realized that the laughing reflected nervousness, a reaction to some thoughts that were difficult or uncomfortable. However you react, I pray that if you are a missionary, you will take this seriously, think about it and pray about it. We all know that someday we will retire, or we will die. And we know that at that time, the ministry that the Lord has given to us will no longer be our responsibility. We trust that the Lord will say ‘Well done, good and faithful servant! I assume that we have all made some plans for that day. Plans for old-age care, plans for retirement income, plans for how we may be cared for. Some of you may say, there won’t be any Social Security when I get to that age. Well…maybe yes, but let me tell you that 50 years ago I heard that same thing—Social Security won’t be around when you retire. But you know what? Polly and I have been retired for more than ten years, and half of our retirement income is from Social Security. And, without it, we never could have carried out those post-retirement volunteer ministries that we have done since we retired. The Lord provided, nudged us to save money and pay into Social Security, and He has used us for His glory in retirement. Others of you will say, “The Lord will provide.” Here is where it gets sticky. I agree that the Lord will provide. But, what I want to gently but forcefully nudge you about is the development of an exit plan. This is important for all, but especially for those who are caring for foster or adopted children. An exit plan is a deliberate setting out of how your work will be carried on when you are no longer able to do it. It tells what happens to your facility, to the children, to the students, to the parishioners, to the organization, to the community when you are gone. And note, I didn’t say when you are dead and gone—just gone! I want to urge you to write out three exit plans, and to review them faithfully every three years. Exit plan for what would happen if you were forced to leave tomorrow morning. Now, I know, you are 25 and it seems ridiculous for you to be worrying about what happens 40 or 50 years from now. But, it is not ridiculous, it is just responsible. It won’t take long to write that one out. It may be 40, or 30, or 20, or 10, or (gasp) five years from now, but it won’t hurt you to outline where you think your project will be then and how the Lord would want you to leave it for someone else. Remember, you will be reviewing this retirement exit strategy every three years so you can modify it as situations and needs change. But at least you will be assuring that the assets the Lord has given you will be respected and used well after you leave the field. You need to be thinking about what might be happening in five years. And, oh yes, if you are caring for needy, abandoned children, when you are offered the opportunity to take on responsibility for a new child, use either old math or new math, and figure out what age you will be when that child is 18. 3. Exit plan for what would happen if you were forced to leave tomorrow morning. Aw, that’s not going to happen, not as long as my health holds and my kids get along here OK and my parents don’t need any help as they age, and the social and legal situation allows me to stay…. A good friend was air-evacuated overnight from her country of service a few years ago by a health concern which was uncertain at best and raised the initial issue about whether she could return. A missionary family experienced a sudden emergency with one of their children and had to evacuate the country for his protection—never to return. On our first morning in Honduras, a missionary was flown out on less than 24-hour notice because he had received an extortion threat from a gang. It was leave or risk possible kidnapping or murder. We know of missionaries who have unexpectedly died on the field. A friend pastoring an international church in Europe lost a substantial percentage of his congregation in a plane crash. Some were business people, others were teachers, and, yes, some were missionaries. That’s never something we plan for, but it does occur. Three exit plans, three steps to living and serving here responsibly. I raise these not to frighten you but because I firmly believe we need to be prepared. Several years ago I had the privilege and honor of being the keynote speaker at the annual missionary conference in Honduras. This is an event that welcomes all Christian missionaries in the country regardless of their denomination or mission agency. In addition to presenting five major messages, I also offered the participants two “bonus” presentations designed to provide support, guidance and food for thought. I share these now with you, the faithful readers of my blog. If you are a missionary, I hope you will take them to heart. If not, perhaps you know a missionary or your church supports one and you could pass this on. Below is the first “bonus” message. I will post the second one in a few days. Please share these with missionaries you know, your church mission team, or others who might benefit. I want to take just a few minutes to address something that I have been pondering ever since our time serving as the interim pastor at the International Christian Fellowship church here in Honduras. During those months, we met many of you either at the conference or at church or in other settings. We heard stories of what you are doing, the children rescued from deplorable conditions that now are living in cleanliness and love and tranquility. We heard about churches being planted, people being mentored and restored, families being fed, wells being dug, bodies being healed, souls being saved. We were, to tell the truth, overwhelmed by what missionaries of Jesus Christ are doing in this country, with the people, how you are giving your lives in service. What a joy to know you and to hear you and to pray for you. But, as we talked with missionaries here, in San Pedro Sula and other places, we picked up two stresses, two warning signs, two challenges which many of you face that I would like to address quickly but strongly. Now, don’t misunderstand. I’m not just some old guy telling a bunch of young whippersnappers how they ought to live their lives and carry out the ministry God has given them. Nor, I hope, am I just an old grouch venting my spleen. What I say, I say in complete love, appreciation and concern for you. So, take a deep breath, sit back, and just listen—not to me—but to the Lord. Many of you are tired. Worn out. Fatigued. Yes, burned out. You run day and night (especially if you are working with children), day after day, week after week, month after month. The phone rings constantly, people knock on your door at all hours, supplies must be bought, work coordinated, government regulations complied with, shipments sprung from aduana (customs), visas applied for in migracíon (immigration), prayer letters written, demanding work teams housed, guided, entertained, construction completed, sick people cared for, crying children comforted, meals cooked…it goes on and on. And, one thing I learned last year was that while you are faithful at your work, complete in your leadership, trusting with what has been given to you, while you are all of these things, you are absolutely terrible, lacking, disorganized, systematic and just baaaad at…taking a break, getting a rest, going on vacation, getting away from it all. And, let me tell you just a few things that you may think would be taking a break, but aren’t. Taking a weekend off to write and address and mail your prayer letters. No way—that’s part of your work, it’s in the job description, sooner or later you will be forced to go home because of low support levels if you don’t do it. So, it’s not vacation, a day off, a rest to do your prayer letters. Going on furlough. If you think that furlough is a restful vacation…It’s work, hard work, demanding, stressful, enjoyable, yes, but work. A change of pace—while refreshing and perhaps enjoyable, isn’t a vacation. Coming to this retreat is a change of pace, but it’s not getting away from our work. What is a break, a vacation? That’s for you to determine. For some it’s a week away from the funny farm just sleeping, watching TV, reading, playing with grandchildren. For others it’s a few days at the beach or in the mountains, or a trip to the city—eating in good restaurants, taking in a movie or two, shopping at the malls, visiting friends. For others it may be a grand tour of Europe, a visit to family back home, hiking, camping—you name it. Yes, you name it, but whatever you name it, do it! Because if you don’t the whole thing will come crashing down around you eventually. If you were tasked with writing a history of your church, what would you include? Several decades ago I assisted an association of churches in a radio series which presented the history of each if its congregations. Members of the church wrote the five or ten minute scripts and a representative of the congregation came to the studio to do the recording. To add a bit of interest, I suggested that they utilize sound effects to illustrate their historical stories. To my surprise the most requested sound was hammers and saws. Only one church asked for something different—they had established an orphanage for children left as orphans during a smallpox outbreak back in the 1850s. So it goes. Recently on a trip I picked up a small pamphlet outlining the history of an historic church in a Mississippi River town. I was not surprised to find that it, too, is a history of building construction, remodeling, the selling and buying of property along with a list of pastors who served there since 1807. Somehow we can’t see the forest for the trees, or the movement of the Lord for the business of fellow humans. How I would love to read a church history that related stories of those whose lives were changed when they committed themselves to Jesus Christ. I would like to know about ministries that changed the course of the community or led people to crucial outreach in the church. Wouldn’t it be great to know about people who taught Sunday school into their nineties? Of others who relocated overseas as second or third career missionaries in their sixties or seventies; to hear about pastors who went beyond their normal call to write books or establish a homeless outreach or mentor seminary students? How exciting it would be to read about unique ministries such as the founding of a children’s home, the establishment of housing for the elderly, a resettlement program for refugees, the instituting of a scholarship for those going to seminary or Bible college, a counseling program that healed wounded souls, an outreach to mentor pastors new to their calling—the list could go on and on. If you or your church are considering writing a history, be creative, be motivating, be faithful in telling not your story or the organization’s story, but the story of what God has done through the congregation. To Him will be the glory. There are times that Christians make sweeping, misleading statements with good will but potentially disastrous results. These have an element of truth, but when examined are found to be, at least, deceptive and at worst, harmful. They are akin to saying “all food is good for you.” While one could argue that all food, from meat to vegetables, starches to fruits, sweets to vitamins contribute to nourishment and filling the stomach. But, anyone who has read a recent newspaper or talked with their doctor will know that some foods in excess are harmful, others have little or no nourishment, and some can be outright dangerous. Let’s look at three such statements that I have heard over the years. Would that this could be true. Across most of our communities and around the world people are serving the Lord through countless ministries that point to God’s love and compassion. Food pantries, clothes closets, rehabilitation centers, feeding programs, all are expressions of Christian concern and can be, but not necessarily are, opportunities for evangelism. Note the key words in these texts; teaching, preaching, testifying. All indicate a verbal, spoken, communicated sharing of the Gospel of God’s grace. Each of them involves, yes commands, the spoken Word, the teaching, preaching and telling of the Gospel story of forgiveness of sins and eternal salvation through Jesus Christ. To do good works in Christ’s name is laudable and required of each of us. To do them and fail to share in whose name we do it and what Jesus’ purpose was is to fail to evangelize. To proclaim that everything we do is evangelism can allow us to omit the telling of the Good News. Here the argument can get a little obscure. In our modern age, what is and isn’t worship has become a bit confused. Let it be understood, first, that worship is more, much more than just the music. With the development of “worship teams” which lead a congregation in musical praise, the concept has arisen and is often spoken that when the music is over, the worship has finished and we move on to other things. The reality is that a worship experience involves various elements, and each and every event during that time period should be focused on God. Worship is the time we set aside to praise Him, to pray to Him, to hear His word, and to commit ourselves to Him. Worship moves from one “activity” (music, scripture reading, prayer, the proclamation of the Word) to another, until it reaches its climax in the confession of faith, the sharing in communion, and the baptism of new believers. But, too often, we unintentionally interrupt that flow with announcements, promotion of groups and events and the like which divert us from the Lord and re-focus our attention on ourselves or our institution. Those elements which distract from our focus on God and His activity in our life, His word, commitment to Him are not worship. They are entertainment, institutional promotion, whatever, but are not worship directed toward glorifying Almighty God. At first glance, that’s a laudable concept. Certainly, we all can be reaching out, using daily opportunities to proclaim the Gospel. But, when that was said in church recently, one could almost hear an audible sigh of relief. If we all are missionaries, the nagging tug to “interrupt our lives” by becoming a full-time international or national missionary disappears. Gone is the necessity of learning a new language, immersing in another culture, serving the Lord on a full-time basis. Be that a political border or a cultural line or a language divide, that definition implies that a missionary in the purest sense of the word is someone who is called and responds by physically going somewhere, be that locally or internationally, to verbally witness to God’s saving activity in Jesus Christ. If we are all missionaries, then each of us must cross a boundary, be it between neighborhoods in our own community, a state line or an international boundary and each of us must be sharing the Gospel, verbally, with others who do not know the Lord. “Everything we do is evangelism,” “Everything we do at church on Sunday morning is worship,” “We are all missionaries,” – there may be an element of truth in each of these statements. But, let us not become distracted or complacent when we hear them. Evangelism, worship, mission work, are not that simplistic. Indeed, each is deep and fulfilling when lived out in complete, holistic service to the Lord. As I have been reading about the terrible disaster following the September earthquake that destroyed vast portions of the Indonesian coastline along the Central Sulawesi province, I am reminded of a similar disaster which occurred along the Venezuelan coast in 1999. That mudslide killed at least 50,000 and left uncounted thousands more buried. Even in the face of such an overwhelming disaster, I remember the signs of hope that Christian rescuers and relief workers experienced eighteen months after the Venezuelan tragedy. More recently, Reuters reports that “the 7.5 magnitude quake on Sept. 28 (2018) brought down shopping malls, hotels and other buildings in the city of Palu, while tsunami waves smashed into its beachfront. But perhaps more deadly was soil liquefaction which obliterated several Palu neighborhoods. No one knows how many people are missing but the toll is in the thousands, and rescuers say that the number could be in the multiple thousands. The official death toll had risen to 1,763 by October 7 but bodies were still being recovered. Given the impossibility of removing so much soil, officials in Indonesia said debris would be cleared and areas hit by liquefaction would be turned into parks and sports venues. Jono Oge in Indonesia was hit hard by liquefaction with dozens of teenagers at a nearby church and Bible camp killed. Many of them lie buried in the mud. That same impossibility of recovering so many buried bodies faced the Venezuelan workers. The December, 1999 flood and mudslide disaster in Venezuela may have left up to 50,000 dead. Catastrophic storms brought massive destruction to hillside squatter communities in the capital Caracas and along the coast. I visited the disaster site along the Caribbean coast a year and a half after the mudslide. Here are excerpts from my report: Today, neighborhoods still look like scenes from a war zone or earthquake devastation in India, with the exception that most buildings are buried or filled up through the second floor with rocks and mud, their families still entombed inside. Nobody really knows how many died in the disaster, and few are willing to guess. “The government says 30,000, I think 50,000, but residents along the coast say more than 100,000,” says Darrell Horn, a Southern Baptist missionary who has worked in disaster relief for the past year and a half. 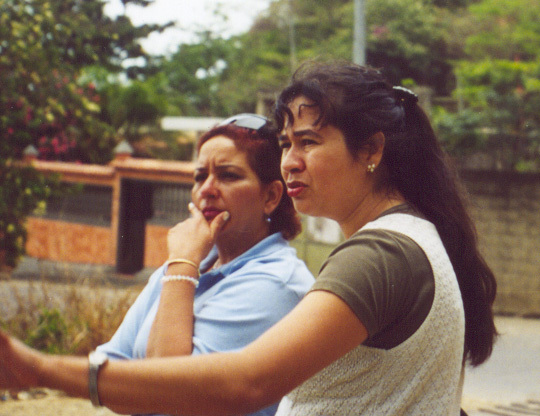 “The problem is that many families have been separated by the government relocation efforts while other families don’t know whether their relatives are living in another city or are dead,” says Berenice Cabrera, director for disaster relief for the Evangelical Council of Venezuela (CEV). “We are working with refugees as far away as Maracaibo (350 miles) who haven’t seen or talked with their families since the floods,” she adds. There are reminders of the disaster wherever one goes along the coast. Standing on the waterfront amid piles of dirt and rocks, Berenice says that the water line is a block or more away from where it was before the disaster. The sweep of water and mud dumped tons of dirt into the ocean and rescue workers added to the fill as they removed the debris. Missionary Horn knows one mother who waited over seven months to learn that her two teen-age daughters were still alive in another city. Despite the overwhelming disaster and sobering acceptance of so many disappeared who would never be uncovered, I discovered a moving moment of hope amid the disaster. “Look, the trees are starting to come back!” Rebecca Domingues points to some shoots pushing up through unbelievable piles of mud and rocks. Interrupted by God? Interrupted by God! What do you want to be when you grow up? You know that question, you were asked it when you were a child or teenager and you may have asked if of your own children. But, there comes a point in life where we no longer want to deal with such questions. For one, we may have already decided. Or, perhaps we think we have. Or, maybe, we have made that decision several times and still find ourselves drifting with no definitive response and are too embarrassed to admit it. Or, we think we are too old to deal with it—we are at or almost at retirement age and it is no longer relevant. Go away, don’t ask. Don’t interrupt. Just let me finish off and get on with whatever. No matter your place on the time line of life, those words about allowing God to interrupt our life can come as a shock, a disappointment, an annoyance, or, they can be a breath of fresh air, a hope of significance, a promise of something more fulfilling. A promise to fit ourselves into God’s will for us (rather than trying to persuade God to fit into our own will). The Lord comes and interrupts us at the most unexpected times. It may be in the midst of completing our education. It may be in the middle of raising our children, or paying off our mortgage. It may be as we are enjoying the empty nest and grandchildren. Or it may come to us in retirement. Whenever, we must be open to having our lives interrupted by our Lord as he calls us to serve Him in some capacity. That call can come to any one of us at any time, from childhood to our senior years. You name it; there are openings in the Lord’s kingdom service for each of these and more. Each of those I have named, we have seen at work on the mission field. Wherever you are in your life’s span, God is knocking at your door, inviting you, yes you, to follow Him.